(L to R) Les Isbrandt, Kelly Hayden, Malcolm Crooks, and Jade Greene. New Hope-Solebury High School senior Kelly Hayden received the 2016 Malcolm Crooks Honorary Scholarship from the Aquetong Watershed Association (AWA) on May 17. On hand to present the award were AWA Director and President Les Isbrandt and AWA Director and Secretary Jade Greene. In the fall, Hayden will attend the University of Virginia, and plans to major in premedicine and neuroscience, the latter of which requires additional study in psychology, biology, genetics, chemistry, biochemistry, physics, and computer science. 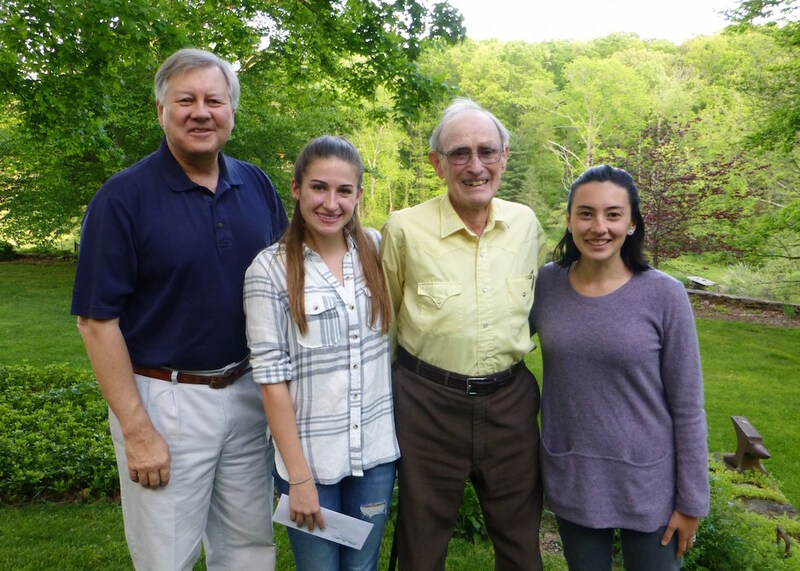 The AWA established the Malcolm Crooks Honorary Scholarship in 2013 to be awarded to a civic-minded New Hope-Solebury High School senior who has displayed excellence in science, and who plans to continue their formal education in the broad field of physical sciences. Malcolm Crooks is a Solebury Township native, lifelong conservationist, and the founder of many conservation-oriented nonprofit organizations, including the AWA. Crooks has been actively involved with conservation since the 1940s, and continues today to be a strong voice for protecting the environment. The AWA was formed in 2007 as an all-volunteer, non-profit organization whose mission is to conserve, preserve and restore the natural resources of the Aquetong watershed. Since its formation, the association has performed an assessment of the watershed, conducted educational workshops, monitored the quality of water in the watershed’s streams, planted trees along stream banks to create protective riparian buffers, and served as the voice of the Aquetong watershed to the community and to Solebury Township and New Hope Borough elected officials. To learn more about the AWA and its scholarship program, check out their website, send them an email, or call (267) 714-8170.